Most of us — even techies, marketers and other ‘non-designers’ — at some time need to produce a diagram to help explain our views and ideas. For the purposes of this article, I’m going to characterize a ‘diagram’ simply as a geometrical symbolic representation of information. Graph based diagrams: This includes Tree Diagrams, Network Diagram, Flowchart, Venn diagram, Existential graph etc. Chart like diagrams: This includes histograms, population density maps, exploded view, three dimensional diagrams etc. Currently there is a growing selection of tools which focus on drawing charts. Gabrielle has already given us her views on the 5 best online tools for creating amazing charts. In this article, I’ll be discussing some tools with the flexibility to cover both categories. But first let’s consider the parameters we should keep in mind while selecting a tool. As data is often owned by more than one master, collaboration with colleagues in real-time is a useful feature. Through this, you can invite your colleagues and clients for online chatting to discuss and contribute to diagrams in real-time. This kind of active participation by everyone to improve the diagram further. The tool should be easy-to-use. The canvas should be clearly visible with scroll up-down options. Drag-and-drop shapes and point-click features are covered under every online diagram tool. A common feature provided by online tools is integration with Google Drive, Google Apps, JIRA, Confluence, Jive, and Box. The tool should be like a social network where team members and individual users can share their suggestions and thoughts regarding diagram development. This feature comes with a valuable restriction of creating diagrams privately or sharing it with others for promotion or suggestions. The tool should provide with a feature to export and import diagrams. Some of them also provides with inserting images from computer, internet and cloud. The output can be in the form of image/file/document formats like jpg, bmp, pdf, csv, etc. Perhaps you’ve seen the CSS revision history feature in WordPress while updating child themes? A similar history feature is provided by some online tools which helps users in tracking and reverting changes in diagram development. Sometimes it is important to look for a tool which helps novice users in becoming an expert. This is done by referring to help files and learning more about the features provided by the tool. Becoming an expert will help is easing with diagram development. A high quality online application should provide support for various other native languages besides English. The tool needs be fast to both load and use. Drag and drop functionality should not slow the whole process. Recovery options can also be provided in case of accidental corruptions or deletions. Compatible as it’s built on open web standards. Integrated with Google Drive, Google Apps, Jira etc. You can try the demo without signing. Exporting the diagram to different formats like JPEG, PNG, PDF is simple. Real-time collaboration with the team. 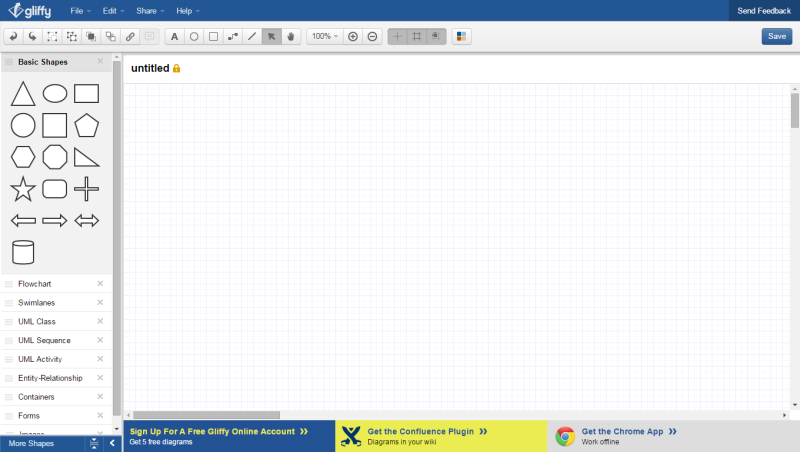 Provides revision history of the diagrams created. Easy to share diagrams online. They’ve provided with hundreds of templates and examples. It’s an excellent tool to create diagrams online, go through LucidChart’s overview given on the home page of the website. There is a plug-in provided for JIRA. They claim to have an uptime of 100%. Revision control is done in users Google Drive. Translation is provided in more than 25 languages besides English. Wire framing and mock-ups are part of free plans. Some of its features differ from others like 100% uptime, JIRA plug-in, translations etc. They’ve also provided some differences on their official blog which makes them one-step ahead Lucid Chart. Real-time collaboration is possible through which all team members actively participate in modifying and improving the diagrams. Files can be easily created and edited with easy to share features. The diagrams can be exported in different formats. Users can create a network of team by joining groups and inviting colleagues. This makes the process simpler. Translation of the application is provided for 3-4 languages and rest is in process. They’ve provided various themes and templates. It’s easy to publish and share diagrams. Revision control automatically stores each version which leads to ease in tracking changes. Google Drive integration is provided. Visio documents can be imported. 1-click create feature for drawing faster. 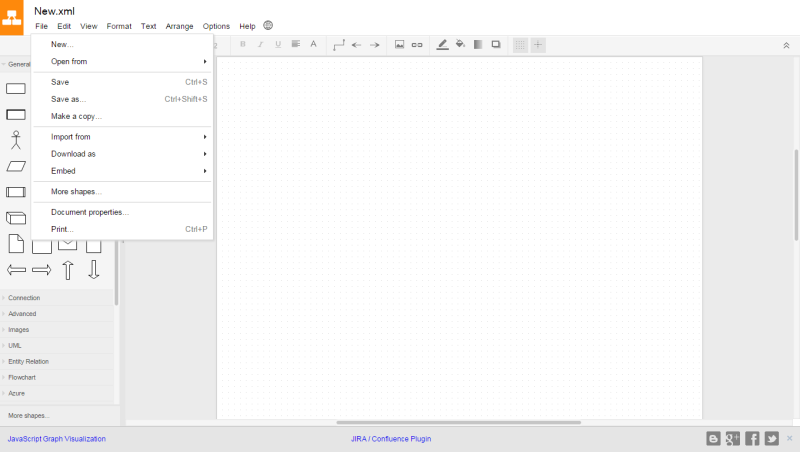 With a single click and drag user can add the next shape and the line connecting it. Importing SVG vector images is possible. 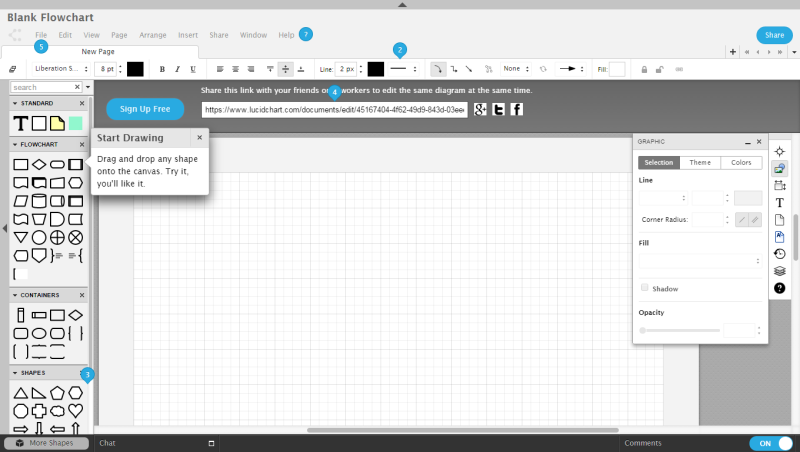 Users can add 100 of shapes to the diagram. Arranging, aligning and fixing heights are easy through its user-friendly interface. Different preset color themes for shapes styling to customize lines and even gradients. Inline comments and discussion thread. They’ve provided with full revision history. 100,000+ diagram examples are also provided for referring. Secure View only or Edit enabled links to send to colleagues over email. Lucid Chart Try its demo without signing up. They report that their Chrome Extension and Firefox plug-in have more than 2 million users. Trusted by Ford, Harvard University and many others. Draw.io Translation of the application in more than 25 languages. Try its demo without SigningUp Claims 100% uptime and provides JIRA plugin. Amazing positive reviews on its chrome app. ProcessOn Users can create a network of team/events by joining groups and inviting colleagues just like a discussion forum. Also provided translation of application in various languages. Gliffy The world’s first net-native business graphics application. Provides easier approach for tracking changes. Trusted by CISCO, Samsung, IBM, Adobe and many others. Creately Secure sharing with user-friendly amazing interface. Thousands of examples and libraries for users. Trusted by Paypal, Amazon and many others. Amit, Thank you for the share. ProcessOn always strives to provide a handy and intuitive diagram service. 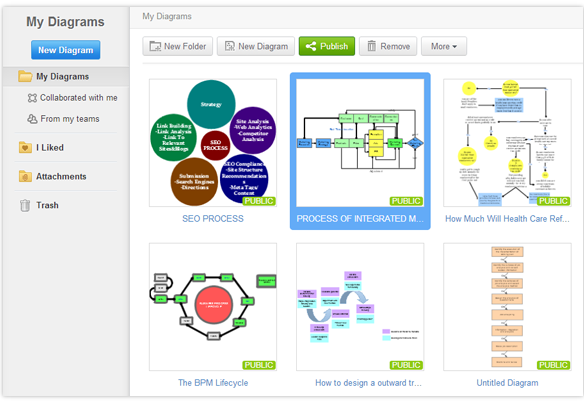 Another news is ProcessOn mindmap is launching tomorrow. You're welcome and congratulations for mindmap. Thanks a lot for adding Creately to the list. As you have mentioned we pride ourselves been the faster diagramming software going around. Check out the YouTube video for an overview of the features.